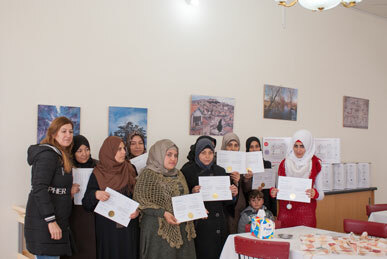 The graduation of the first group of single mothers (Syrian refugees) for the academic year 2017/2018 was held in Maria Schneller Hall on Friday 19 January 2018 at 10:30 AM. Ten women who completed the three-month training program in sewing skills received their certificates and a sewing machines. One of the women graduated in absentia as she was not able to attend. Attending were the JLSS heads of departments. The director opened with a word of prayer. He then thanked Mrs. Carmen Zino for her work. He congratulated the women on their achievement and wished them success in their work. With their acquired skills they should be able to support themselves and their children. The women then cut the cake which was baked for the occasion by our kitchen staff. After cake and refreshments it was time for photos. The single mothers expressed their sincere gratitude to Schneller School and EMS/EVS for the training and all the other support they and their children received through the program. We express our sincere gratitude to our German partners EMS/EVS for supporting this wonderful program.